Have you ever felt ashamed about buying a certain book? Or embarrassed for shopping in the teen/young adult section even though you’re over the age of twenty-five? Well I have something important to say to you. STOP! Stop being embarrassed! Stop being ashamed! If you want to read a book then read it, if you want to buy a book then buy it. If someone says something to you about it just ignore them. Your opinion is the only one that matters when it comes to what you read. 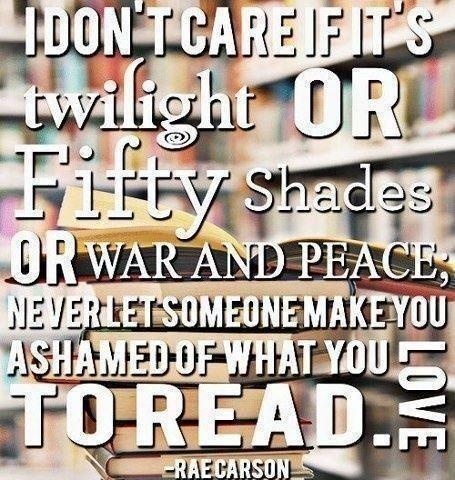 I think probably the most obvious example is Fifty Shades of Grey by E.L. James. I will admit that I do own this book. I bought it when there was still so much hype simply because I wanted to see what had people either excited or enraged (I also wanted to see if it was as similar to Twilight as people were saying, which it was). Now, I will also admit that I didn’t actually finish reading the book because I found it so similar to Twilight. All the things people were saying about E.L. James novel were fresh in my mind so I put the book down and decided to open it again at a later day when I could be more objective. However, more than the similarities to Twilight or the fact that everyone was so entranced by Christian Grey, the thing I remember most about this book is how awkward I felt buying it. I remember standing in line and trying to hide the cover and feeling my face burn when I handed it to the lady at the register. Looking back now I realize I literally had no reason to feel that way. I am someone who enjoys reading; I enjoy reading books that are not-so-well-known and I enjoy reading popular books to see what’s so exciting about them. In the case of Fifty Shades, it was bought for the latter reason. But there was already so much stigma surrounding this book when I bought it that I felt I had to be ashamed. I had a similar feeling shopping in one section of the store. The Chapters near where I live is divided into typical sections, one of which is ‘Kid’s Books (6-12). Well, the issue I have here is that I am no longer between the ages of six to twelve and yet I still read some of these books. The Land of Stories by Chris Colfer and Percy Jackson and the Olympians by Rick Riordan both reside on these shelves as well as the entire Harry Potter series. I have been told that I am too old to shop in this section, but I must say that I disagree. I don’t think you can ever be ‘too old’ to shop in any section of a bookstore. Browsing this section I used to feel awkward because the people looking at books next to me were clearly between 6-12 and I was very obviously not. However, this did not stop me from looking around and eventually buying The Land of Stories.